This campsite in Chopta offers you a fun adventure in the gorgeous Himalayan wilderness, away from the pollution and noise of your daily city life. You'll be staying in a comfortable tent and enjoying the fresh air and mountain views at Chopta which is known for its scenic beauty. You can spend the day at this campsite, go on day treks and nature walks, and enjoy a crackling bonfire at night. Chopta lies in the Kedarnath Wildlife Sanctuary in Uttarakhand, and is famous for the sprawling meadows and evergreen forests here. 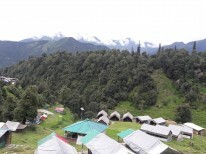 The campsite in Chopta is located close to the trek route leading to Tungnath, the highest Shiva temple in the world, and is also close to Chandrashila, a gorgeous emerald lake. You can check in to your campsite in Chopta by noon. You'll be greeted with a hot cup of tea, and will be ushered to your tent. You can unpack and freshen up, and then the rest of the day is yours to spend as you choose. You can go on a nature walk, or just choose a nice spot and spend it reading your favourite book. By evening, a crackling bonfire will be lit, and you can watch the sun setting over the peaks. After a hot dinnr, you'll retire to your Swiss tent for the night. Wake up early to catch the early morning mist in the mountains. You can go for a morning run, meditate or do yoga with the mountains in front of you, or go for a walk. You'll eat a hearty breakfast, and then it's time to pack your bags. Your camping trip in Chopta ends here. You can check in any time after noon, and will be greeted with a hot cup of tea. You can check in to your Swiss tent and enjoy the rest of the day. You'll be served evening snacks and tea, and then a bonfire is lit in the evening. For dinner, you'll eat a full course meal of one seasonal veg dish with dal, rice, salad, chapati, pickle and a sweet dish. You'll sleep in cozy tents that come with attached western toilets and washrooms. You'll also have clean bedsheets and soft beds to sleep on. Wake up in the morning to some hot tea served to you right in bed! Once you finish packing up, head for breakfast. For breakfast you'll have many options such as parathas, bread butter with jam, omlettes, hot noodles or a traditional puri bhaji dish. You'll also have the regular tea, coffee or any local hot beverage you prefer. You'll check out from the Chopta campsite after breakfast.